Wow your audience in your next presentation with ProGraph: Volume 5 from Pixel Film Studios! With Gradients to choose from in Final Cut Pro X, watch as your audience is in awe as they see your presentation swipe across the screen in a whole new way. Present your facts and arguments in visually fascinating ways that won’t put your viewers to sleep. With ProGraph: Volume 5, you now have the ability to move the camera in 3D space, creating an environment for your graphs. Wow your audience as you show off your info in a whole new dimension. Move the camera around your graphs simply by altering it’s position and rotation. All with in Final Cut Pro X with a click of a mouse. With ProGraph: Volume 5, you now have total control of the camera and it’s depth of field. Control the blur amount, focus offset, near and far focus, as well as the angle of view. With this new and exciting way to show off your stats you are sure to catch your audience’s attention. With ProGraph: Volume 5, we give you new and exciting ways to display your information all with in Final Cut Pro X.
ProGraph is back again with styles that please. Don’t bore your viewers to death by showing the same graphs over and over again throughout your presentation. Keep them stimulated by showing unique visual representations for each point. With over 180 elements and 13 unique styles, ProGraph: Volume 5 is sure to get your ideas across in an interesting and engaging way. With ProGraph: Volume 5, you have the ability to insert your video or photo along side your graphs. Change the width or height of an average rectangle media frame, or if you would like, choose from a wide range of icons with in the media frame category . Scale, rotate, and position all with a click of a mouse with in Final Cut Pro X. Use the on-screen controls in the Viewer window to position your ProGraph: Volume 5 element exactly where you need it on the screen. Then use the intuitive controls found in the FCPX Inspector window to pivot and rotate your element in 3D space. ProGraph: Volume 5 was professionally designed to work seamlessly inside Final Cut Pro X. You don’t need to be a statistician to use ProGraph: Volume 5, but you might look like one if you do! Simply drag and drop one of the graph layers into the timeline. Then, use the on-screen controls and easy-to-use parameters to customize your presentation to your liking. Where do I find ProGraph: Volume 5? 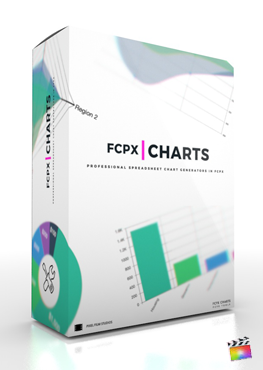 Once the installation is complete, you can find ProGraph: Volume 5 in the FCPX Title library.